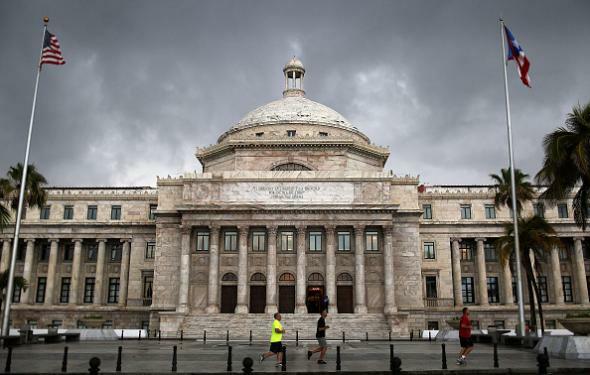 Puerto Rico water rationing: Two days each week as drought continues. The Capitol in San Juan, Puerto Rico. In July, usually one of the wettest months, the island got just 4 centimeters of rain. Now, 2.8 million residents live in a part of the country suffering either an “extreme” or “severe” drought, according to the National Drought Mitigation Center … Government officials are telling residents that now is “not the time” to wash their cars, fill private swimming pools, or hose down their sidewalks and patios. Not all residents have been affected—the west side of the island is still fine—and most tourist resorts, this New York Times piece says, are served by an aqueduct called the “supertubo” that is still functioning.